Purée shallots, lemongrass, ginger, ¼ cup oil, lime juice, tamari, sugar, salt, pepper, and coriander in blender until smooth. Place chicken in baking dish. Spoon lemongrass mixture over chicken. Rub on all sides. Cover. Refrigerate ½ to 2 hours. Heat 2 teaspoons oil in medium saucepan over medium-high heat. Add quinoa. Cook until toasted, 3 to 4 minutes. Add broth. Bring to a boil. Cover. Reduce heat to medium-low. Simmer until liquid is absorbed, about 20 minutes. Remove from heat. Let stand, covered, until ready to serve. Heat skillet over high heat. Coat with cooking spray. Add chicken. Cook, turning once, 10 to 12 minutes (chicken should reach 165°F.). Remove chicken. Let rest 2 minutes. Slice each breast, on diagonal, into ½-inch pieces. Heat remaining 1 tablespoon oil in large skillet over medium-high heat. Add peas and peppers until tender-crisp, about 3 minutes. Season with salt and pepper. Turn off heat. Toss in mint. Divide quinoa among 4 plates. Top each with 1 sliced chicken breast and ¼ of vegetables. Serves 4. 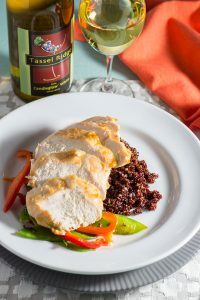 Wine Recommendation— Tassel Ridge Iowa Candleglow ® White Iowa Candleglow ® White from Tassel Ridge is a dry, fruity white that will complement the flavors in the chicken and its seasoning. Iowa Candleglow White has pineapple, pear, melon, and apricot notes on the nose and palate and a finish that hints of green apple. This dry white is made from La Crescent, Brianna, and Edelweiss grapes grown in our Mahaska County, Iowa, vineyards. Serve chilled. — Bob Wersen, Owner, Tassel Ridge Winery.